My husband works hard and long days outside as a recycling driver. It’s kind of a crappy job, but he’s very good at it. He needs good sustaining food to work all day non-stop. He leaves very early in the morning (4am) and usually eats his breakfast on the go. We were buying him protein bars but they were 1) expensive and 2) I couldn’t pronounce a lot of the ingredients. So I started making him breakfast cookies. They were good but they were too “cookie” like and they didn’t last long because everyone wanted to eat them! So I started looking into granola bars I could make myself. I had no idea how EASY it was! Here is the recipe I’ve come up with. Give it a try, you’ll be amazed how easy it is too! 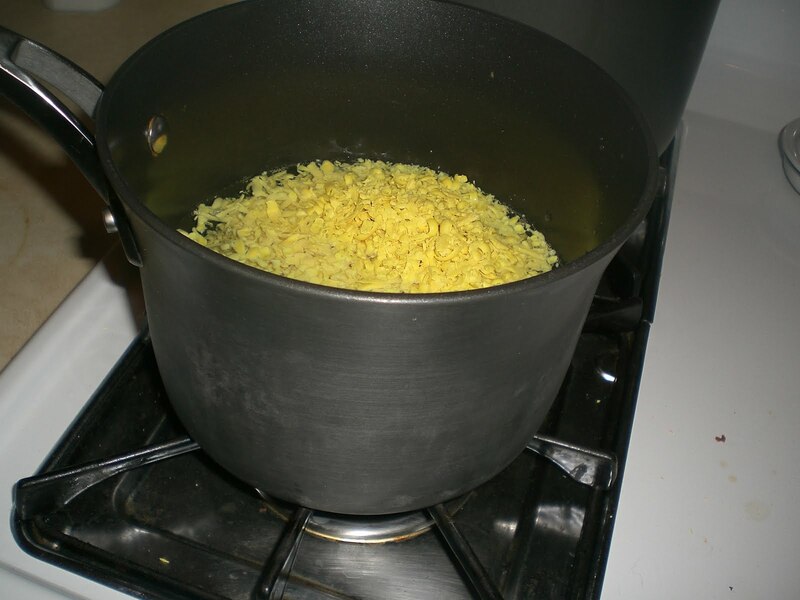 In a small saucepan bring agave or honey and brown sugar to a boil and remove from heat. Add peanut butter and vanilla, stirring to mix well. Combine all the rest of the ingredients in a large bowl and pour in brown sugar mixture and mix well! Spread into a 9×11 WELL oiled (with Pam) or lined with parchment paper pan and press down evenly. Pre-cut into bars and then refrigerate until set. Put into individual packages and store in fridge until ready to be packed for lunches! 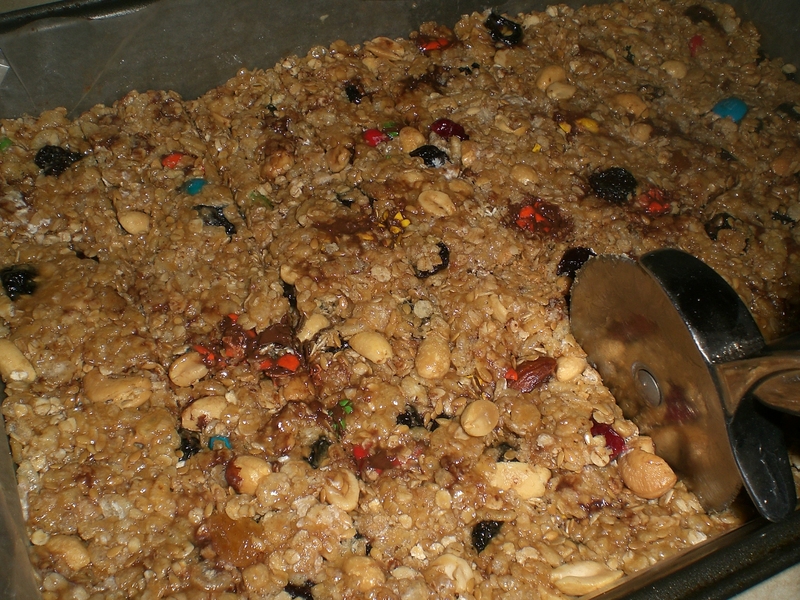 You can replace the cereal with just extra oats and trail mix for a simple fruit and nut bar. Just as good! My last batch had no rice cereal and was made with honey. This batch has the cereal, agave and flax seed. I also picked all the almonds out of the trail mix because they make Jason’s mouth itch. I’m such a good wife! Place beans, garlic, lemon juice and 1/3 of the reserved bean juice into the processor and turn on. Stream in olive oil until it has reached the desired consistency. Keep processing for 5-8 minutes (or longer) until it’s as smooth as you’d like. That’s it. Some recipes call for tahini but I haven’t been able to find this at my local Freddies so I just leave it out. My taste buds don’t care. Seriously. 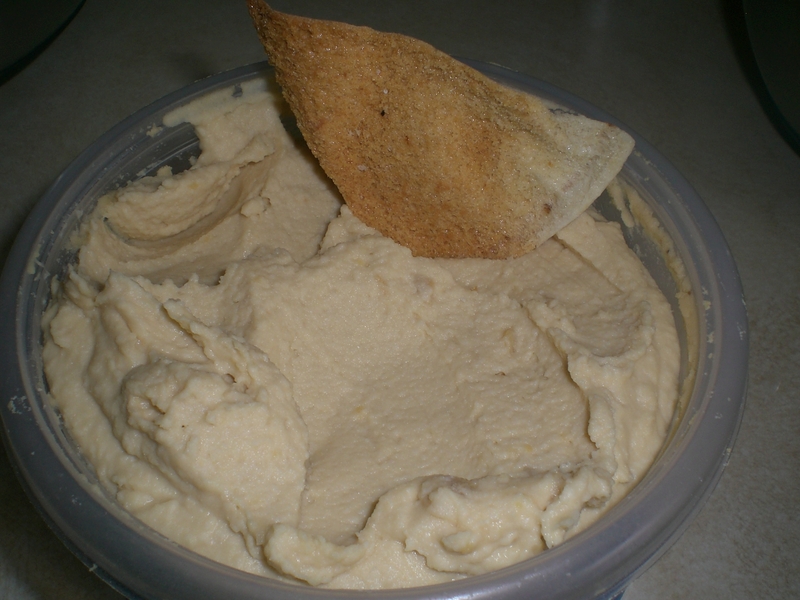 I eat this with veggies, pita chips (keep reading to see how I make quick and easy chips), pita bread and by the spoonful. Just kidding. I don’t eat this with a spoon! Buy or make pita pocket bread. Cut into pizza-like slices and separate halves of the pocket and place on cookie sheet. Spray with olive oil or canola oil and salt lightly. Bake at 375 degrees about 15 minutes, or until crispy. Enjoy! Yummy. 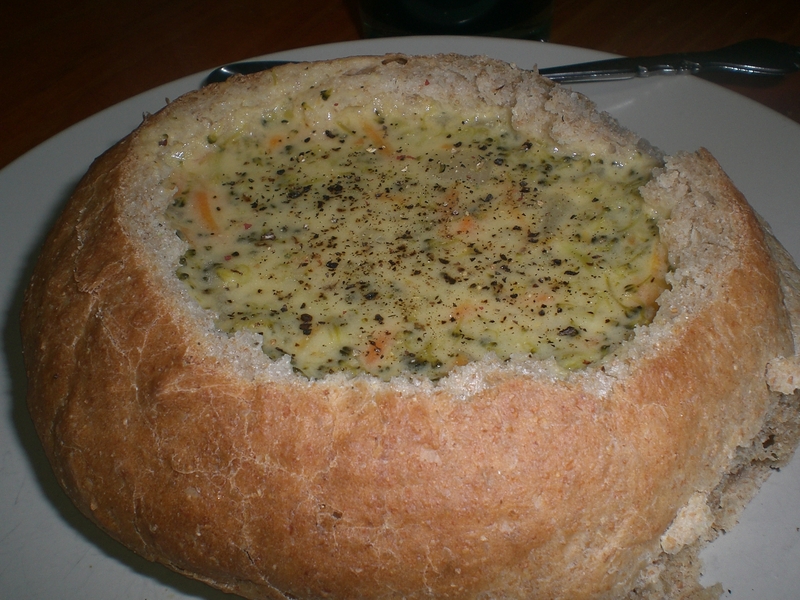 Now this is supposed to be a copy-cat recipe of Panera’s Cheddar Broccoli Soup, but since I’ve never had soup at Panera I can’t tell you how close it is. I can tell you it was good. Very, very, very, (veryveryveryveryVERY) good. And easy. Can’t beat good AND easy! I made my regular wheat bread dough (double recipe) and formed large bread balls about half the size I wanted the bread bowls to be. They were all different sized. Jaizy had a little one and Jason had a large one and everyone else was something in between. Bake as directed on bread post for the most part. I baked mine on a baking stone about 10 minutes less than normal. If you need help with the bread bowls, just ask. That made 6 bread bowls. Here is the recipe as listed, my ingredients modifications are listed below. Steam the broccoli however method you choose. I used the microwave. Chop broccoli into pieces that are about the size of peas with a knife or food processor. Pour the chicken broth into a large saucepan with the half and half. Whisk in the flour and then add the remaining ingredients including the broccoli. Turn the heat to medium and cook, stirring often, until mixture begins to bubble. Reduce the heat and simmer for 30 minutes or until the carrots are tender and the soup is thick. I have mondo family so I made 2.5 times the recipe. Plus we like leftovers. I must add that I like love adore pepper, so I sprinkle layer cover my food generously. I started making peanut butter a couple weeks ago! Oh My Goodness, YUM! And so stinkin’ easy! You take peanuts – (yea, duh, right?) If they are in a shell, you de-shell them, lay them on a cookie sheet and roast them at 325 for about 8-10 minutes. Be sure to give them a shimmy-shake every few minutes! Throw a few handfuls into a food processor and do some spurty chops and once the nuts are in tiny pieces just throw that sucker into high gear! Stream in a couple tablespoons of canola or peanut oil while it’s processing and let it go for about 5 minutes, or until it’s the consistency you like. Then I added a little splenda for flavor, but you could use honey as well. Last week I bought some that were already honey roasted (OH MY GOODNESS!) and just made them right up in the processor as they were! Yumm! It went fast! They kids have never eaten so much peanut butter before (ok, me too…) It was lovely on bread, apples, a spoon… you get the idea. Now, let me tell you about food processors. They don’t have to be real fancy. Mine was an attachment that came with my blender I bought a year or so ago. Of course IT BROKE TODAY! Stripped the gear making hummus! Oh, the catastrophe! BUT where I was going with this is you can buy the little $10 electric food chopper and make up small batches at a time. It will work! I may have to go pick one up tomorrow if I can’t find a suitable replacement STAT on craigslist.com! I bought my original small 1.5cup electric food chopper for $5 at Target about 13 years ago when I started making my baby food. It lasted until I sold it at my garage sale last year. That was through 3 different babies I made food for, plus whatever else I used it for. Did you know it’s way, Way, WAY cheaper to make your own cleaners? I’m sure you’ve heard it all before, but it seriously is! Not only is it WAY cheaper, but it cuts a LOT of chemicals out of your life. Do you need chemicals to obtain clean? NO! Seriously, NO! There I’ll say it one more time for emphasis: NO! mix well and store in a 6 cup air tight container use approx 2 tablespoons with each load. The salt acts as a scrubbing agent. Blend and store in container. Use like you would Comet. Mix all ingredients and store. Pour into spray bottle when needed. Here is my next test: To make my own liquid dish soap. I’ve been researching different methods so I’ll list them here, try them out and then let you know what I come up with. As for the Castile Soap, I was able to find some at Safeway (Dr. Bonners 18-in-1, in the health food section) that was already scented. I’ve heard this works just fine, just be sure to omit the essential oils since they are already added. It came in Mint and Lavender. This method is by far the easiest because the base is pre-made within the castile soap. 1. Grab some liquid castile soap from your local health food store. Castile soap refers to any soap that is made entirely from vegetable oil. 2. 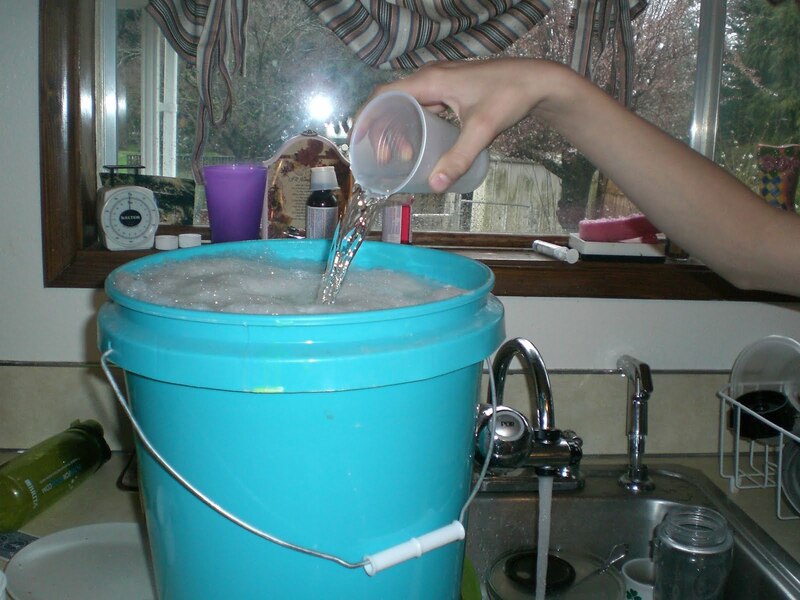 Mix 2 cups of castile soap with 1/2 cup of warm water in a recycled dish soap squeeze bottle. 3. For scented dish soap, add a few drops of essential oils. Buy soap flakes where you usually purchase laundry detergent. 1. 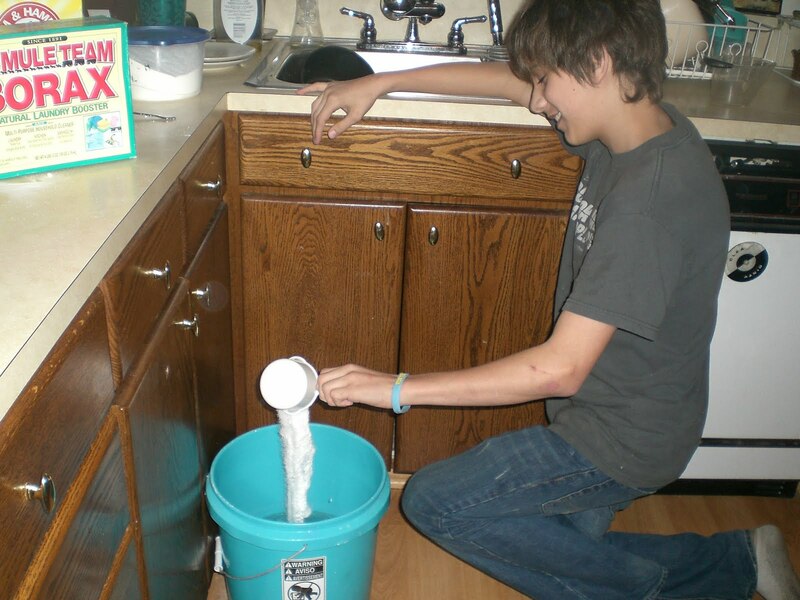 Combine 2 cups of soap flakes with one gallon of warm water. 2. Place the mixture in a large, non-reactive pan and warm over medium heat until the soap is completely dissolved. 3. Add 2 tablespoons of glycerin and remove from heat. 4. After letting the soap cool, add a 1/2 cup of lemon juice or 1/2 cup of white vinegar. Either of these 2 ingredients will help the soap to fight grease. 5. For a scented soap, add a few drops of essential oils. Mix well. – Grate bar of soap and add to saucepan with water. 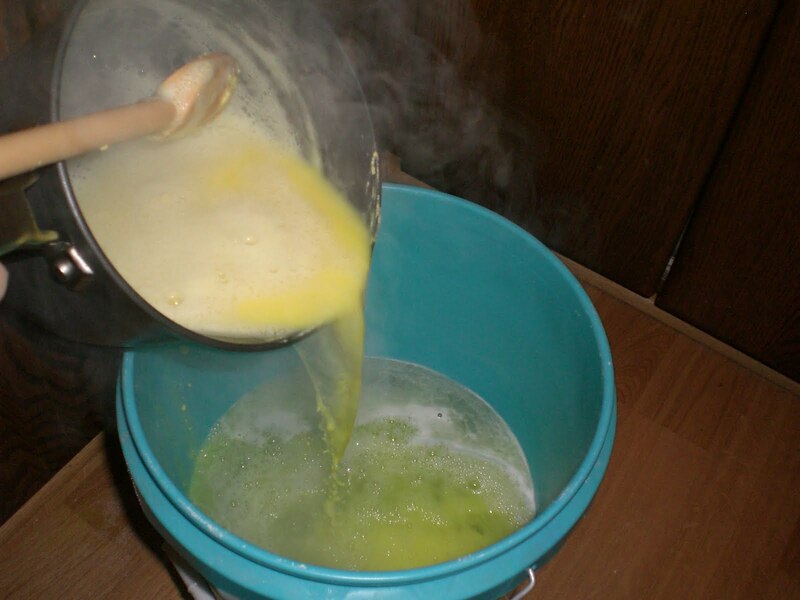 Stir continually over medium-low heat until soap dissolves and is melted. -Optional: You can add 10-15 drops of essential oil per 2 gallons. Add once soap has cooled. Ideas: lavender, rosemary, tea tree oil. I like it just the way it is, so I don’t add essential oil. I use the Bounce Bar in my dryer and I just LOVE how my clothes come out! If you need some pre-treating or stain removed (Or like me, pee-pee bed clean-up) soak the load in the washer with a little Washing Soda. That’s Washing Soda, not Baking Soda! BIG difference and you get it in the laundry aisle. I got all of these ingredients at Fred Meyers. 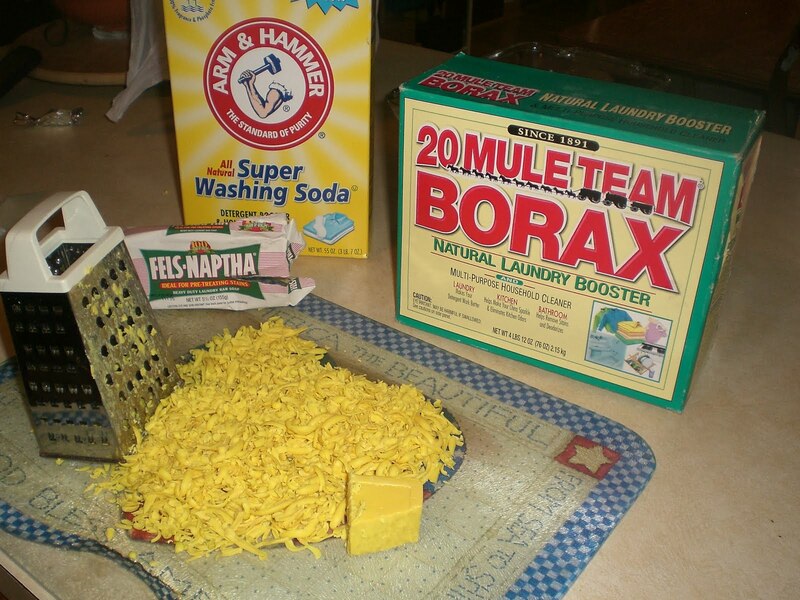 The Fels-Naptha bar was about $1.50, the Washing Soda about $3 and the Borax about $4 (it’s cheaper at Walmart) but you don’t use all of the washing soda and borax, so I try to adjust that into the final price. Now, I keep what we aren’t using in the original 5 gallon bucket and just refill our little detergent bottle as needed (or rather, Jason does for me!) And I’m pretty sure I’m not using the full 5/8 cup, since I just use the top cap that came with my ultra detergent of yester-year. We do about 10 loads a week and it’s lasted me 6 months. And please, please keep in mind my husband works for the garbage company and does recycling, so his clothes are SMELLY when he comes home and they come out NOT smelly from the wash! Yummm…. Pancakes! Is there anything more significant on Saturday morning besides pancakes? I think not! I’ve dabbled in pancake recipes for years, looking for the “perfect one.” I was almost convinced it was only achieved by restaurants, because I love me some restaurant pancakes! But I found it, about 2 months ago. Try them and then try to tell me it’s not perfect! I found the recipe on one of my favorite blogs “Chickens in the road” Suzanne is a romance author turned farmer. She’s so stinkin’ cute! 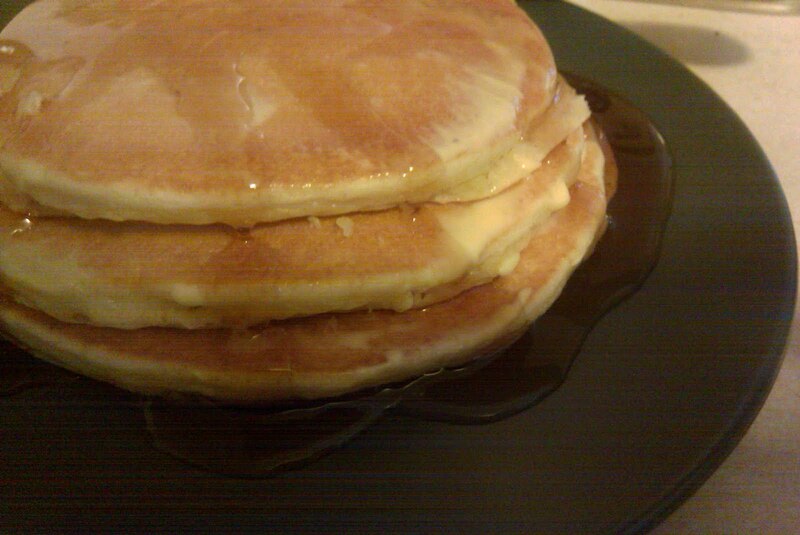 Anyway, I got a lot of my bread making technique from her as well as this amazing pancake recipe. Plus, can you not love a recipe that gives you a base for so much more? Simply amazing!